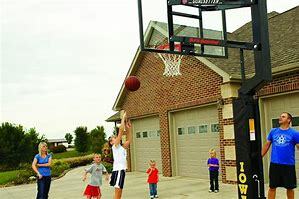 Some people feel a house is not a home without a basketball hoop in their driveway. Manufacturers of basketball systems have made it easier than ever to find the type of setup that best fits your space and playing style. The type of backboard or goal system you buy depends on whether you’re up for a serious game of basketball, you’re just looking to shoot around, and who will be playing on the basketball system. Backyard Fun is an exclusive distributor for Goalsetter basketball systems. Goalsetter is “the Best in Basketball” , and that’s no joke! Proudly made in the USA since 1991 and backed by the best warranty in the industry, Goalsetter Basketball Systems are designed for years of fun and entertainment for all playing levels and ages. With 12 different adjustable backboard and goal models to choose from, we are sure that we can find the perfect match for your family’s basketball hoop needs! What makes a Goalsetter Basketball System so original? Everything! Virtually every inch of a Goalsetter backboard system, including the parts you never see, is designed to enhance the performance and durability of your basketball goal. Goalsetter’s exclusive features crush the misconception that all basketball hoops are created equal. Goalsetter Systems embraces the belief that the quality of a product is much more than a collection of stand-alone features. True quality lies in all aspects of the way they run their company and build their basketball products. Goalsetter basketball systems are manufactured domestically in the United States with quality and durability in mind. Every component used in the manufacturing process of Goalsetter basketball hoops has been carefully engineered and fine tuned. The Goalsetter Inground Signature Series Goals include unique features such as the patented compression height adjustment system, fortified acrylic or glass backboard, one-piece off-set structural steel pole, and patented hinged ground anchor. All of these features, which cannot be found in competing systems, crush the misconception that all basketball goals are created equal. These American steel and glass backboard hoops are strong enough to last year round in the toughest elements. And the hand crank systems make it easy for your children to lower or raise the hoop as needed! At Backyard Fun, our goal is to provide you with a premium quality basketball goal to be enjoyed for years to come. We invite you to experience how Goalsetter Systems has redefined home court basketball and will allow you to embrace the tradition of the greatest game ever created. Need more proof? Then come check them out in person at our showroom. And don’t be afraid to break out a game of one-on-one with your little ones while you’re there. Give us a call today, and Get Out and Play!